From Bacteria to Bach and Back: The Evolution of Minds. By Daniel C. Dennett. W.W. Norton, New York, 2017. ISBN: 978-0-393-24207-2. 496 pp. Hardcover, $28.95, Softcover, $18.95. For most of human history, people have assumed that some kind of vitalistic essence had to be added to matter to produce life. The belief in an immaterial soul was pervasive. At one point, a scientist even tried to weigh the soul by weighing a body right before and after death, expecting to find a decrease when the soul departed (see Benjamin Radford’s column in the Skeptical Inquirer “Measuring Near-Death Experience,” May/June 2007). For most people, it is almost inconceivable that a purely material brain could produce consciousness. It is all too easy and appealing to imagine that consciousness is an immaterial essence that can survive death or to resort to the cop-out that “God did it.” And we are appalled by the idea that a materialistic account of consciousness might abolish free will and moral responsibility for human actions. 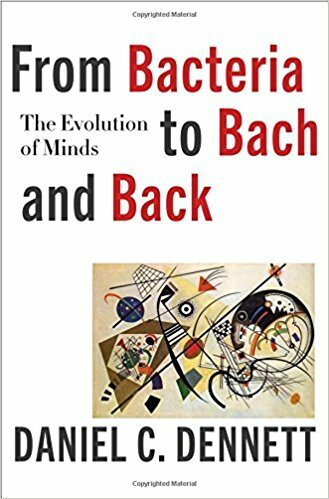 Philosopher Daniel Dennett’s new book From Bacteria to Bach and Back: The Evolution of Minds goes a long way toward illuminating these conundrums with facts and arguments from evolution and neuroscience. Biology is reverse engineering; we must ask “What has happened?” rather than asking “why” a feature evolved because no intentional purpose was involved. Organisms have developed spectacular competencies without any need for comprehension. Some animals (for instance, crows) demonstrate a degree of intelligence and problem-solving that is more powerful than simple trial and error, but this can be accomplished by unconscious processes. If unconscious processes can accomplish so much, What is consciousness for? Why do we need conscious comprehension? How could it have come about, and how has it benefited the human species? Dennett says, “Brains are more like termite colonies than intelligently designed corporations or armies.” Evolution “designed” the brain through a bottom-up process rather than a top-down intentional design. Animals can do things for reasons without having any comprehension of those reasons. Humans can articulate reasons for what we do; they may be self-deceptive reasons, but we “own” them. Memes are “an element of culture that may be considered to be passed on by non-genetic means.” They have their own reproductive fitness. Words are memes that can be pronounced. Like genes, words are informational structures that determine ways of doing things. They are not necessarily discrete and may not be faithfully transmitted. Just as there are typos in printing, there are transmission errors in memes. In computer jargon, a “thinko” is like a typo—a clear mistake or bug in programming. There are standards that allow for correction. Like genes, memes can mutate; transmission errors can lead to extinction of the meme or can serendipitously result in a better meme. Like viruses, memes can spread without being noticed or consciously approved. There is no way to predict how genes or memes will evolve. Language may have originated as inefficient behavioral patterns. As it progressed, it may have been driven more by its benefits to memes than by its benefits to speakers. Today it has evolved into a remarkable tool that enhances human communication and productivity far beyond anything other animals have achieved. Other social animals might make spectacular use of language if they had it: “Somehow our languageless ancestors stumbled onto a rare path to this treasure and myopically followed it, getting some advantage along the way, or at least not losing ground, until they hit the jackpot,” Dennett writes. Why humans and not other animals? It must have been preceded by prelinguistic cultural transmissions of some sort (cooperation and imitation boosted survival fitness), but the rest can be ascribed to chance. Words are the best memes, but they were not the first memes. There are many hypotheses about why humans were more likely than other social animals to develop culture and language, including bipedality, manual dexterity for toolmaking, and the theory of mind. Competition may have been a more powerful driver than cooperation. Confirmation bias (highlighting positive evidence for our beliefs and ignoring negative evidence) suggests that certain patterns of errors in human reasoning were honed for persuading others in debate, not necessarily for getting things right. Consciousness and free will are real, but they are not what people think they are. This is akin to currency. Dollars are also real, but the actual dollar bill is only a token to represent an idea that everyone has agreed upon. Credit card transactions deal in dollars without actual dollar bills. “Our thinking is enabled by the installation of a virtual machine made of virtual machines made of virtual machines.” We are only aware of the user interface not of the intricate underlying details. The advantage of the user interface is that it allows us to make our competencies somewhat accessible to other people, and then we get to use them ourselves as “guests in our own brains.” We can explain ourselves to others and to ourselves. Dennett quotes ethologist and roboticist David McFarland: “Communication is the only behavior that requires an organism to self-monitor its own control system.” Self-monitoring allows an organism to avoid revealing too much about its current state to competitors. Communication may be more grounded in deception and manipulation than in cooperation. We have the illusion of a “self,” but this self has limited access to what is happening in the brain. Consciousness simplifies things for our benefit; an awareness of all the underlying operations would hopelessly clutter our minds and would only handicap us. We only have access to the results of underlying brain processes, and we confabulate a model to explain what we think has happened. Our first-person reports could be wrong, and there are ways to examine consciousness from a second-person viewpoint. A more objective approach may show you features of your own experience that you were not aware of. We have an inborn propensity to see causation; we attribute our perceptions to external causes, but some perceptual representations are internal, for instance optical illusions. Descartes was a dualist who believed an immaterial soul animated the brain. He didn’t know what we know today about neurophysiology. He could only imagine a mechanical model of the brain with wires, pulleys, or hoses, so he jumped to the conclusion that thinking must involve something additional that was immaterial. He relied on introspection without realizing how unreliable it was. Dennett notes that “Human consciousness is unlike all other varieties of animal consciousness in that it is a product in large part of cultural evolution, which installs a bounty of words and many other thinking tools in our brains, creating thereby a cognitive architecture unlike the ‘bottom-up’ minds of animals.” It is a user illusion that gives us limited access to the workings of our brains and thereby empowers us to be intelligent designers of artifacts and of our own lives. Free will is not an illusion we would want to get rid of; “it’s where we live, and we couldn’t live the way we do without it.” Dennett thinks our systems of morality and justice should “punish when punishment is called for, but with a profoundly different framing or attitude.” As a thought experiment, he asks us to consider: If you believe no one is ever responsible for what they do, would you abolish all the penalty rules in sports? With computers, we can create things we only partially understand, things that in turn may create things we don’t understand at all. Dennett imagines a future textbook on consciousness encompassing neuroscience, psychology, philosophy, and other fields; no reader could claim to have mastered all the levels of explanation. Dennett is always worth reading, and this latest book distills his current thinking and all he has learned over the years. It’s not a book you would take to the beach for light summer reading; it challenges the reader to think seriously about a variety of subjects. But it’s well written and accessible to the general reader, and it’s a great way to get a better understanding of how consciousness works and how it came about.